Professor Sean Smith is based within the School of Engineering & the Built Environment and is Director of the Institute for Sustainable Construction (ISC), Professor of Construction Innovation and University lead for Impact for REF 2021. He lectures on the architectural technology programmes covering research and innovation of new construction products and systems. In 2018 he led the submission for the school to be awarded the status of CIAT Centre of Excellence in Architectural Technology. In 1992 graduated with BSc Building Economics and Quantity Surveying and was awarded Ph.D. from Heriot-Watt University in 1997. His PhD research was funded by the EPSRC and the Defence Research Agency developing SEA mathematical models for predicting sound and vibration in complex structures. He was a guest scientist at the Canadian National Research Council construction research laboratories (1994), was an invited post doctoral researcher at the Italian government research laboratories (1998) and invited guest scientist German government research laboratories (PTB – 1999). He joined Edinburgh Napier University’s Building Performance Centre and RMP Acoustics in 2001 and was RC UK Academic Fellow for five years. During 2007-08 he served as Associate Dean for Knowledge Transfer and Commercialisation. In 2008 he was appointed as Professor of Construction Innovation. In 2010 he was appointed Director of the Institute for Sustainable Construction as and has led many national and international research and knowledge transfer projects. During his period at Edinburgh Napier University he has undertaken over 400 research, knowledge transfer and expert services contracts. He has undertaken research and knowledge transfer projects funded by the EU, Innovate UK, Scottish Government, SFC, DCLG, Defra, Building Standards Division and many industry organisations and trade bodies. His research outputs and advice have been adopted in building regulations across the UK and he has been an advisor to CEN and ISO Standards Committees. He led the HBF Robust Standards Details Research Project resulting in the Robust Details regulatory approach for sound insulation and between 2004 and 2018 over 1 million UK homes have been built incorporating these specifications and design details. He was principal investigator of the Low Carbon Building Technologies Gateway, supporting with his staff over 200 new innovative products and processes for low carbon buildings. 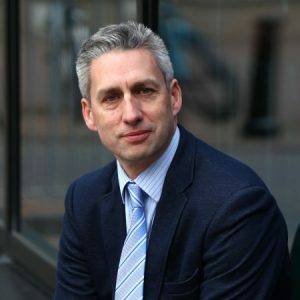 In 2012 he was principal investigator for the Scottish government “review into offsite construction” which forecast the strategic growth and importance of this sector to the economy. He has given evidence to various parliamentary committees in relation to carbon reductions, skills and low carbon economy and construction. During 2010-13 he chaired EU COST Action WG3 relating to harmonization and robustness of standards involving 32 countries. In 2013-14 he led the eleven universities partnership bid with industry to establish the £7.5 million Construction Scotland Innovation Centre (CSIC). His has significantly contributed and led the submissions for both Queen’s Anniversary Prizes for Higher and Further Education awarded to the University for his research teams and staff relating to housing innovations and quality of life (2009) and sustainable construction, timber engineering and wood science (2015). He serves on a range of industry and professional body groups including the CIAT Research & Education Committees, RD Standards Committee, Timber & Forest Industry leadership group and previously served for several years on the Construction Scotland industry leadership group. He has been a reviewer for research grant applications for Innovate UK, EPSRC, Carnegie Trust, CSIC and Textiles Future Forum and overseas government science policy units. The impacts of his construction research projects and innovative processes developed for industry organisations have led to multiple benefits for the construction manufacturing and house building sector. He is co-author of five patents involving 17 innovative product solutions for acoustic, thermal and structural performance within buildings, which are manufactured in the UK and licensed to multinational companies. In 2016 he was awarded an Honorary Fellowship of the Royal Incorporation of Architects in Scotland due to the positive impact of his work on sustainability and quality of life in the built environment. In 2018 he was invited by the Scottish Government to chair the working group on New Housing and Future Construction Skills.